To view this video, visit https://www.youtube.com/watch?v=Y21DG7OlEAI. Messages carry ideas from senders to receivers. Sometimes the sender has one specific receiver in mind. Some messages have many receivers. 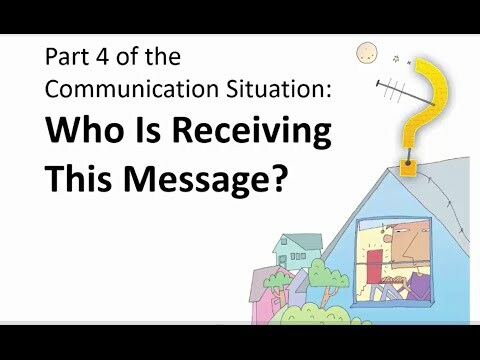 Watch this video to understand how to think about the receiver of any message. Your Turn Analyze the receiver. Think of a message that you need to send. Perhaps you need to discuss a misunderstanding with your friends. Maybe you need to congratulate your brother or sister on winning a race. Or maybe you need to write a report that you will present to your class. Pick a message that you need to send and answer these questions about it. Who else might receive this message? Imagine that this message goes viral on the Internet. Who might receive the message then? Imagine that this message lasts 100 years. Who might receive it then? What might happen if someone you didn't intend receives this message? Will you change your message to adjust for other possible receivers? Why or why not? Analyzing the Receiver of a Message by Thoughtful Learning is licensed under a Creative Commons Attribution-NonCommercial-ShareAlike 4.0 International License. Based on a work at k12.thoughtfullearning.com/minilesson/analyzing-receiver-message.